About a year ago, I attempted to cut Gracie's hair myself. It almost turned into a bob by the time I'd finished it and I vowed never to try again! 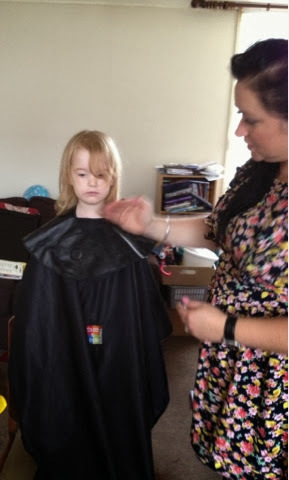 Yesterday when my mobile hairdresser came to give my hair a cut, Gracie decided she wanted hers done too. I was dreading it to be honest. She is at a stage where she doesn't even like me brushing her hair so for her to let someone who is a stranger to her loose with a pair of scissors on her hair was a frightening thought. I was half expecting her to flinch mid cut and end up with another short hair do. In reality she was perfect! 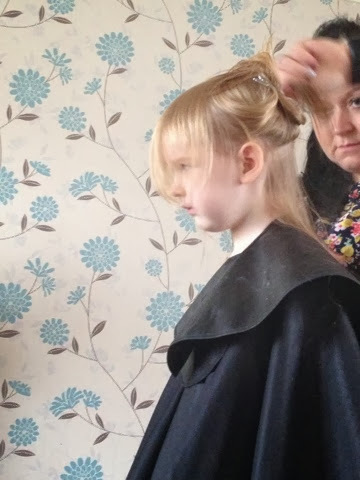 She stood up on a chair with a gown around her and was such a big girl staying ever so still like she was told and was all excited to see her new pretty hair. 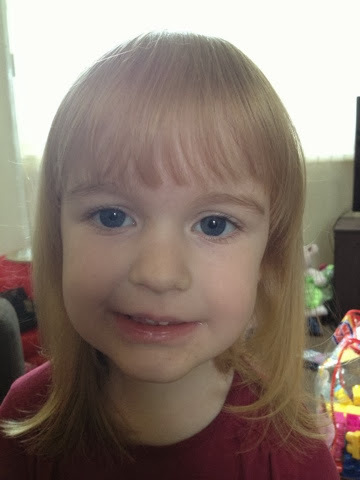 She only had a trim and a fringe cut and I kept a lock of her hair to go in her memory box. She looks so grown up now! Zach's hair is getting a bit long too but I didn't dare try with him with his inability to sit still for longer than 10 seconds! Although it could have made for a hilarious blog post I'll save that one for another time.